He’s several things to millions of people, but one thing we feel that Darshan Raval’s going to be great at, is being a ‘love dost’. 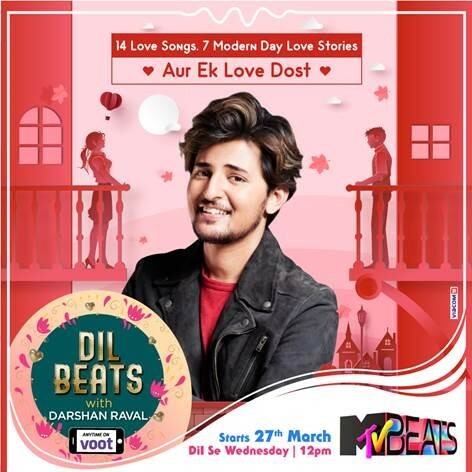 The pop heartthrob will be listening in and helping out millennials with their love problems on the show called Dil Beats, which airs on MTV Beats, every Wednesday, since March 27. Darshan made time for us, en route to a gig over a phone conversation and he sounded like just the friendly voice you need to hear when you’re down. Tell me about this new show of yours! It’s an amazing, beautiful, very different show on MTV Beats. It’s called Dil Beats. It’s not a typical love guru kinda show. I’m going to be a love friend to everybody. The best thing about the show is, what I am in real life, I’m going to be that on screen. I’m going to be singing songs, I’m going to talk to people about what I feel about love. I’m just going to be a friend to them. Also I’m going to listen to them as well if they want to say something to me. Lot of music is going to happen, I’m going to sing a lot of my songs and a lot of other composers’ songs as well. And the biggest thing is, I’ve composed a title track for the show and that’s a deadly song. The show in three words. You’re single. How does that qualify you for being a love guru? What keeps love alive in a relationship? Most important factor is trust, space and believing in the other, just how pure the emotion of love itself that keeps growing. Samantha Ruth Akkineni has started an advice column on Twitter. If you had to ask her for advice, what would you ask? I don’t think I will be able to ask her anything. I’ll just go out of words. I’ll go completely blank If I have to ask her anything. Love or respect in a relationship: Which is more important? I think both are equal. Pyaar mein without respect, you won’t survive only. Being single or being in a relationship: which is better? Depends on your lifestyle. If you are like me, I’m continuously travelling everyday and focusing on myself and I have a lot of people with me who I have to take care of and make music for them. Right now, I don’t think I’m in the right space to have someone in my life. Being in a relationship cannot be planned: hona hai toh ho jaayegi.